On one of the many occasions over the years when my father found himself in the hospital for a medical procedure of some sort, a young, unsuspecting nursing student was dispatched to his bedside to record his medical history before surgery. After 10 minutes or so of recording all sorts of accidents and maladies that had come my dad's way, she began to become both a little exhausted and a little exasperated. Her every, "Anything else, Mr. Hooley?" was met with my father, indeed, having something else for her to record. Double skull fracture...hand in the cornpicker...finger lost in a carpentry accident...shoulder surgery...40 stitches from a malfunctioning saw...heart attack...another shoulder surgery....heart bypass surgery...cancer...knee replacement. On and on it went until finally she offered another weary, "Anything else, Mr. Hooley," and my dad paused briefly before raising his right hand, where he was indeed missing four fingers from a cornpicker accident on the farm. As he held his hand aloft, he extended his right thumb into the air, prompting her to say, "Your thumb? Is there something with that thumb, Mr. Hooley"? My dad looked at me, sitting there amused, and said, "Yes. That thumb is about the only thing I haven't hurt." 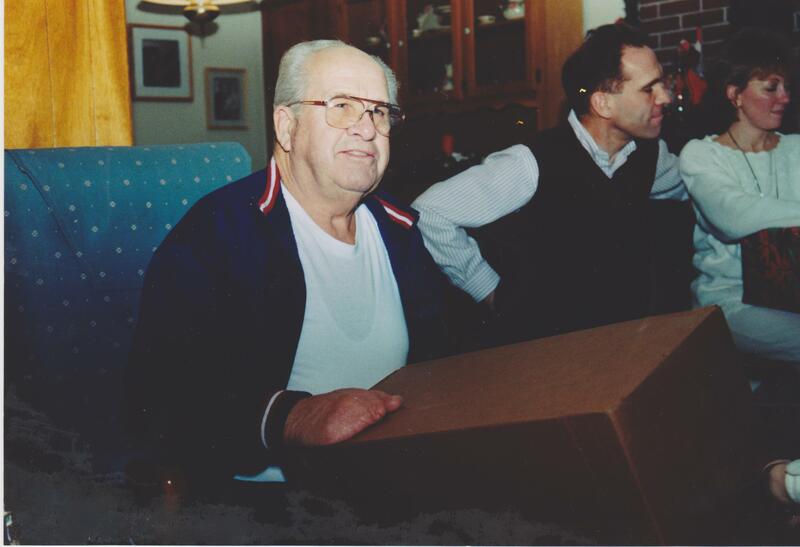 After almost 91 years, my dad's broken, but still strong body finally yielded to a final heart malfunction eight days ago and he went home to be with the Lord. It is where he wanted to go, where he spoke of going, not just that night in his final hours in the hospital, but as early as a year ago when he told me one day, "Bruce, I just can't wait to go to heaven." This surprised me and troubled me a bit, because I wasn't ready then, nor am I now, to let him go. I told him his words surprised me and he said, "Oh, Bruce, my life has just been wonderful since I turned everything over to the Lord and put him in charge of everything." That certainty he had of eternal life with Jesus is why I can smile through my tears. You see, I didn't lose my dad. I know exactly where he is, and I marvel at what he must be experiencing right now, and what he would urge everyone to make certain they get to experience some day. In order to do that, each of us must do what my dad told the pastor who came to visit him in the hospital Thursday night. He quoted numerous scriptures to her and said, "I serve a Savior who came to seek and to save those that were lost. I was lost, but I know he loves me and I know he will receive me unto himself -- not because of anything I did, but because of what he did for me by dying on the cross to forgive my sins." "You really know you're Bible," the pastor said. And, indeed he did. Dad spent many hours reading the Word in his later years. Finding scriptures to read in his memory was hard only for the many we had to choose from given all those he underlined or highlighted in his Bible. "For I am the LORD your God who takes hold of your right hand and says to you, Do not fear; I will help you." He was amazed by the tenderness of that imagery. "Bruce, just imagine. God takes us by the hand, like a father would his child, and tells us not to be afraid because he will help us." I think of that call from him and I smile, knowing that in the past week he's gotten to experience that which made such an impression on him when he read it. My dad was very open about his faith. He'd often engage a stranger in conversation and ask them, "Do you know my friend, King Jesus?" He wanted everyone to know that God's grace was available to them. I have many vivid memories of my dad when I was young. One of the great lessons he taught me was that working hard wasn't so much a means to an end, but a reward in itself. Many times, after he'd worked all day doing something either in the yard or outside the house, he'd end the day by walking out to the street to look at our property, surveying his handiwork. When I got my own home, I found myself, and still find myself, doing the same thing. I remember my dad as someone who could fix anything or figure anything out. After buying my first house, I told dad I wanted to remove a 60-foot pine tree in the back yard. He came over with his chainsaw and a rope and told me to climb on the branches of the tree up to about 15 feet and then tie the rope around the trunk of the tree. I did that, and then he instructed me to walk to his van and tie the other end of the rope around the bumper. He then told me to walk about 15 feet up the rope line, away from the van, and hang on the rope while he cut the tree. I asked him, "Are you sure that tree isn't going to fall on me?" "Stay right there and you'll be fine," he assured me. My doubts magnified the longer his chain saw cut into the trunk, but if I'd learned one thing over the years, it was to do exactly what my dad told me to do, exactly how he said to do it. So I stayed right there, clinging tightly to the rope, my feet dangling slightly off the ground, using my leverage as he designed it, to pull the tree into my yard and not my neighbor's. When I heard the crack and watched the tree start to fall toward me, it wasn't confidence in what he'd told me that kept me where I was. It was more that I was too scared to move an inch. Sure enough, the tree fell with a mighty crash, with the tips of the top branches, once 60 feet in the air, now brushing the laces on my shoes. I don't know how he knew the tree would stop just inches short of hitting me, but he knew. Dad always seemed to know things like that. Like the time I asked him to help me move my neighbor's yard barn into my back yard. Dad figured out a way to load it onto a trailer, move it into my back yard and position it in the corner where I wanted it. He wasn't satisfied, though, with how the barn sat on the edge of my property. "It needs to go a few inches to the left," he said. I assured him it was fine. The next morning, promptly at 7 a.m., my telephone rang and an authoritative voice greeted me: "Bruce, it's dad. I know how to move that barn where it ought to be. I'll be there in an hour." Sure enough, he showed up exactly at 8 with several pieces of iron pipe and a jack. He raised the barn into the air, slid the pipes underneath the foundation and then backed his truck up against one side of the barn. He gave the engine just enough gas to -- sure enough -- slide the barn exactly where he wanted it. Fifteen minutes after he showed up, he was on the road and back to West Liberty to take mom to breakfast. I'm going to miss having access to my dad's ingenuity, and I'm also going to miss him telling he how much he loved his family. As he grew older, dad often spoke of how blessed he was to have such a close family. In my mind, that is one of the most remarkable things about him -- that he made it a priority to have the sort of family he did not come from himself, and he was able to do just that. Of course, he couldn't have done that alone. He had a perfect complement in mom. In his final hours in the hospital, as I sat by dad's bed, he settled into a very restless sleep, during which he would occasionally say a sentence or two. At one point, around 5 a.m., dad said very clearly, "Oh, mother, mother, mother, mother." He said it in a way that told me he was viewing something wonderful, something inspiring, something that he wanted to share with mom, so she could see what he could see. I think my dad had just caught a glimpse of the glory of heaven that awaited him, because immediately after he said, "Oh, mother, mother, mother, mother." He said, with a touch of awe in his voice, "Oh, thank you, Lord, for this beautiful day." Those were the last words my dad ever spoke. If you remember anything about my dad, remember that he dearly loved Jesus and he loved with all his heart, his bride of 67 years. My brothers and I didn't get away with much around home when we were growing up. But the one thing we never had any hope of getting away with was to disrespect our mom in any way. I didn't realize it at the time, but life has taught me that, as a father myself, there is no greater gift I can give my children than to love their mother with a fierce loyalty that nothing can divide or compromise. So thank you dad, for that example. When they met in the 1940s, by the standards in West Liberty then, my mom and dad were a somewhat unlikely match. It was probably a bit eyebrow-raising back then for a good Mennonite girl like my mom to date a bit of a rogue like Gayler Hooley. In those days, it wasn't appropriate for a Mennonite boy to move out of his parent's home when he was in high school, and it definitely wasn't proper for one to enlist in the United States Army and serve in World War II. Besides that, my dad smoked, and he hung around the pool hall in town. But when he came back from the war he became infatuated with Celia Yoder and so he called her and asked if he could take her to church on a Sunday night. Somewhat shy, she told him, "I'll have to ask my mother." And, so, she did, and her mom said, "I think you should go. I think you would be good for him." I never met my grandma, Katie, in this life. But when I meet her in the next, I will make certain to tell her how absolutely right she was about that. I saw my father cry only once in my life, when my mom had an emergency surgery we weren't sure she would survive. After she came through it, I remarked to him that that was the only time I had seen him cry. He told me that, when I was born, he would wait until all of us were in bed, and then he would go onto the back porch, sit in the swing, put his head in his hands and cry, wondering how he was going to feed us. When I learned about that, it put a lot of things about my father in a much different perspective for me. When I was a kid, I'd be watching a ballgame on TV and my dad would be working outside and I'd hear him call, "Bruce David." When he used my middle name, it usually wasn't good. I'd run outside to help him do whatever it was, and then it would happen. He'd say something like, "Go in the garage, on the north side, in the third cabinet, on the second shelf, beside my Allen wrenches, and get me my hand plane. I knew his directions were impeccable, but beyond remembering that the whatchamacallit he wanted was in the garage, I also knew I had no hope of finding it. I didn't know north from south or east from west. Was it the third shelf on the second cabinet or the second shelf on the third cabinet? And even if I got that part right, I didn't know an Allen wrench from a crescent wrench or a hand plane from an airplane. I'd like to tell you my dad handled my failures in such moments like Ward Clever would times when the Beaver disappointed him, but that wouldn't be true. In times like that, dad was more likely to handle it like Archie Bunker, and I, of course, was the Meathead. I tell you that not to criticize my dad but to underscore how little those times when he lost his patience with me came to matter. I always knew he loved me. I always knew he would do whatever he could to help me. And I came to understand that he'd let me make a mistake just big enough to learn from, but not big enough to cause dire consequences. In other words, my earthly father loved me much like my heavenly father loves me -- like my heavenly father loved him and forgave him for those times when he, like all of us, fall short. My dad wasn't perfect. But, as the bumper sticker says, he was forgiven, by his heavenly father and certainly by his three sons. We're going to sing a hymn near the end of this service. "When we all get to heaven." The chorus of that song says that someday, those who have accepted Jesus Christ as their Savior will, "sing and shout the victory." I picture my dad now, shouting the victory he has in Jesus with that same strong voice of his that I could hear above all other voices in the crowd at my little league games, softball games and cross country meets over the years. His voice no longer struggles for every breath, because dad no longer needs the oxygen tank he wore for the last 5 years or so. His voice is more robust than ever and his glorified body is now perfect in every way -- not just his right thumb that he held into the air as a way of joking with the nursing student who was recording his medical history. How do you say goodbye to someone who will live in your heart forever? Maybe you don't. Maybe you just say, "I will miss you dad, but I will never forget you. And I will always love you for the man you were, and the man you taught me to be."